If you were asked to list top professionals in the sales field in their industry and then asked those professionals to list their biggest influencers, you may be surprised to find out who makes it on those lists. One name you may not expect to see is General George S. Patton. The methods he used to lead in the military can be transferred across lines to be extremely useful in the sales field. Just like Sun Tzu The Art of War is commonly referred to in the world of business. General George Smith Patton Jr. (November 11, 1885 – December 21, 1945) was a senior officer of the United States Army who is best known for his leadership of the U.S. Third Army in France and Germany following the Allied invasion of Normandy in June 1944. 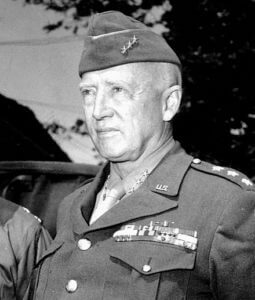 To see how General Patton would set up a sales team for success, consider his principles of command for every battle and every campaign he entered. Patton understood that to be an effective leader you had to truly be in command. This meant to make a plan and take responsibility for ensuring everyone understood and could be successful at his or her job on the team. Everyone under Patton had to accept accountability for the tasks they were assigned. There was no passing the buck; rather the buck stopped here when it came to assessing both failures and successes. Patton was not a micro-manager. Instead, he used officers (supervisors and managers) to carry out the required tasks. If the manager is bogged down in the minuscule details there is no time to plan, organize and set the roadmap to the big picture goal. Proactivity looking for weak links or areas where there is or could be poor performance, problems are quickly recognized, corrected and moved past. This is very different than reacting to poor numbers or sales process problems after the results are tallied. Finally, General Patton saw everyone, including himself, as replaceable. For sales, this means actively encouraging the team to constantly keep growing, developing and challenging themselves to do better and achieve more. The Sales Coaching Institute works with sales leaders and sales teams to develop basic and advanced sales skills to boost sales and exceed goals. Click here to learn more.